You’ve probably noticed that DVD (Digital Versatile Disc) has become the hot method for distributing movies today. However, until recently the process of mastering a DVD movie was complex, and the hardware for recording (a.k.a. burning) DVDs was prohibitively expensive. Thankfully, all that is changing. Apple has been at the forefront of affordable DVD production. Apple released an affordable DVD burner in 2001 called the SuperDrive, and by the middle of 2002 you could buy a SuperDrive-equipped Macintosh for less than $2,000. Prices for blank recordable DVD media have also been falling rapidly, with blank discs now available for less than $10 each. Many other companies have entered the DVD burner fray, and countless drives are now available for both Macintosh and Windows systems for as little as $300. With a DVD burner and the right software you can record your movies onto DVDs, which can then be viewed in nearly any commercial DVD player. Macintosh: Premiere 6.5 for Macintosh integrates with Apple’s DVD Studio Pro to encode and author DVDs. Timeline markers created in Premiere can be used as chapter references within DVD Studio Pro. To integrate Premiere with DVD Studio Pro, you must purchase that software from Apple. Windows: Premiere 6.5 for Windows includes an MPEG-2 encoder, which is the video format used by DVD players. The Premiere 6.5 CD also comes with a program called Sonic DVDit! LE, which enables you to create a DVD interface, create a layout, and author the DVD. 1. If you only want to export a portion of the Timeline, slide the ends of the Work Area bar at the top of the Timeline so that only the desired portion of your project is covered by the bar. You may want to do so if your Timeline includes elements for tape export such as a long stretch of black video or a counting leader. 2. Choose File –> Export Timeline –> Adobe MPEG Encoder. 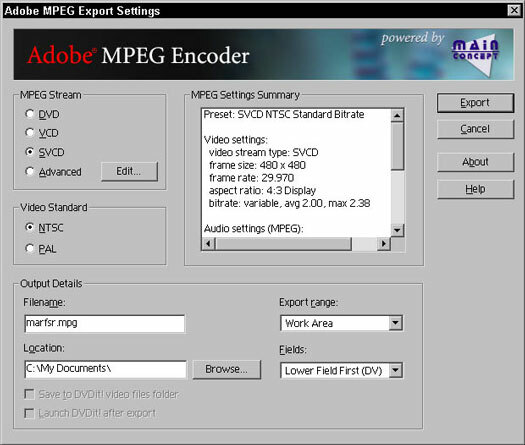 The Adobe MPEG Encoder Settings window appears, as shown in Figure 1. Figure 1: Use the new Adobe MPEG Export feature to export your movies for DVD playback. If this is the first time you have ever used the Adobe MPEG Encoder, you will have to activate it. A dialog box will appear giving you the option to activate it via the Internet or telephone. Follow the instructions on-screen to activate the software. Whichever activation method you choose, you’ll be given an activation code, which must be entered before you can continue using the Adobe MPEG Encoder. Activation is free. 3. Choose an MPEG stream. Use DVD if you are burning onto a DVD disc. If you want to burn the movie onto a conventional CD-ROM, choose VCD or SVCD. 4. Choose a video standard (NTSC or PAL). 5. Enter a filename and location for the output file in the appropriately named Filename and Location fields. 6. If you only want to export the Timeline between the in and out points you set in Step 1, choose Work Area from the Export Range menu. If you want to export the whole project, choose Entire Project from the Export Range menu. As with other export formats, export may take a while. The Adobe MPEG encoder exports an MPEG-2 file. You can then use DVD authoring software to put the MPEG-2 file in a DVD layout and author the DVD. 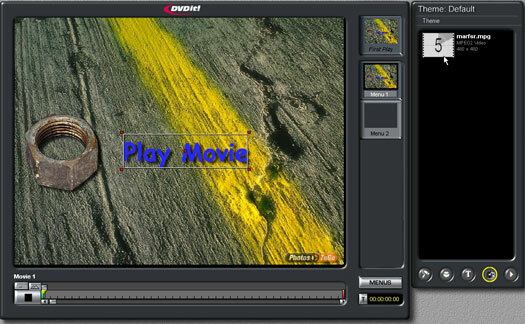 Premiere 6.5 includes a simple DVD authoring tool called DVDit! LE, described in the next section. Figure 2: DVDit! LE is a DVD authoring program included with Adobe Premiere 6.5. 1. Click the Media button at the bottom of the Theme panel. The Theme panel switches to the Media list, which at this point is probably empty. 2. Click Theme to open the Theme menu and choose Add Files to Theme. A Look In dialog box opens. 3. Browse to the folder that contains your MPEG-2 file and open the file. The file appears in your Media list. 4. Click the Backgrounds button to bring the list of backgrounds to the front, and then drag one of the backgrounds to the First Play placeholder. The theme now appears in the main screen and in the First Play placeholder. 5. Click the Text button. A list of fonts appears. 6. Drag a font to the main screen area to create a text object. To adjust the color, size, and other characteristics of text, select the text and choose Effects –> Text Properties. Make sure that any text you add contrasts adequately with the background image. 7. To turn a button or text object into a link, first click the object to select it. A white outline appears around the object to indicate that it is selected. 8. Click the Media button to bring the list of media files to the front, and drag the desired movie file onto the button or text that will serve as a link. 9. Choose File –> Project Settings. The Project Settings dialog box appears. 10. Choose the type of disc that you will be using to record the project in the Output Size menu. 11. Review your current project size to ensure that you aren’t exceeding the capacity of the disc. The maximum capacity for each Output Size disc type is listed in the dialog box. 12. Click OK to close the Project Settings dialog box. 13. Burn the disc or create a disc image. Use options in the Build menu to either make a DVD using your DVD or CD burner, or create an image by choosing Make DVD Folder. If you create an image, you have a folder on your hard drive (in the location you specified) containing all the files needed to create a DVD. Of course, you’ll probably spend a lot more time playing around in DVDit! LE, but this is the basic procedure. You should also check the documentation for your DVD burner; it may have come with additional software to help you author DVDs. And of course, test your DVDs carefully to ensure functionality — before you send them out into the world. If you are creating a master disc image that will be mass produced by someone else, ask the manufacturing facility that you are working with about special formatting requirements and submission procedures before creating a disc image.